Homeowners may assume that their chimney isn’t leaking as long as there is no water puddling inside the flue or the fireplace. However, not all leaks reveal themselves to the naked eye. Perhaps you’ve noticed some stains on the indoor wall or ceiling around your chimney, or that the wallpaper has been peeling away. Maybe you’ve noticed an old, musty smell to your home after a heavy rain or perhaps heard a dripping sound you just can’t quite track down. Or maybe condensation has been collecting inside the firebox and you can’t figure out why. These can all be symptoms of a leaking chimney. 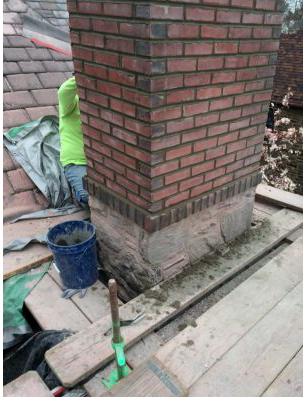 Leaks can be tricky to detect and trace the origin of because of the complexity of chimney design. The most obvious cause of a chimney leak is a problem with the chimney cap. The cap sits on top of your chimney’s flue and prevents water, animals, and debris (such as leaves, acorns, pine cones, etc.) from making their way into your chimney. If the chimney cap is improperly installed, damaged, or missing, then your chimney and fireplace can be exposed to water damage (among other things). You might be able to make your way up to the roof to check out the condition of your chimney cap, but it would take a professional to really be able to determine if the cap was correctly installed. If you want a cap that doesn’t leak, the installer must be experienced and take the required amount of time to do the job right. The masonry on your chimney will eventually experience wear and damage, and this is especially true if one side is more exposed to the elements than another side. Masonry can begin to spall, crack, and deteriorate, and that can happen much faster on the exposed side of the chimney. This type of damage can lead to water intrusion. To make matters worse, it can also affect the structural integrity of your chimney, leading to even more leaks. Such damage and wear also affect the chimney’s aesthetics and reduce the value of your home. Cracks in the chimney crown are the one of the major causes of chimney leaks. The chimney crown is also supposed to keep water from going straight down the flue, but it can be become cracked and thus susceptible leaks. Cracks in the chimney crown are not always just the result of natural wear and exposure: Many times, cracks will develop because of shrinkage or structural changes that take place over many years. Masonry cracks are especially problematic because they will get larger with time. During the winter months, water makes its way into the cracks. Temperatures drop, the water freezes, and the masonry expands. As it expands, the cracks also expand. The result is continuing cycle of worsening damage and worsening leaks. To resolve chimney problems that involve the masonry, you would be wise to seek the advice of a masonry professional. While small cracks can be filled in, larger cracks and spalls will eventually require the removal and re-laying of the masonry. A professional can also waterproof your chimney’s masonry. These processes will leave the masonry porous while still preventing the intrusion of unwanted water and moisture. This special type of waterproofing can even be applied to chimneys with minor existing damage to help keep the problems from worsening. Some chimneys on older homes do not have liners. Liners were not necessary when chimneys burned coal or wood, but once gas furnaces were added, problems developed. Unlike the fumes from wood and coal burning, gas fumes have a lower temperature and contain more moisture. As those gas fumes release up the chimney, the moisture may condense and form water droplets along the chimney’s interior. This not only soaks the bricks with moisture, but it can soak nearby areas as well. Common symptoms of this problem include peeling wallpaper or paint near the chimney as well as moisture in the firebox. The solution is simple: installation of a chimney liner. Another area that can be the source of leaks is the flashing. Flashing refers to the water-tight strip (usually made from aluminum) that seals the seam between your chimney and your roof. Seals can lose their effectiveness as they age, and it is only natural that they will experience some degree of wear and tear because they are exposed to the elements. When this happens, they can begin to allow water to seep into the chimney. This can also happen if the flashing was not installed correctly or experienced some type of damage. If the flashing begins to allow leaks, it can not only cause problems with your chimney but result in expensive water damage to your walls, ceiling, and roof. Professional help is recommended if this is the source of your leak. Chimney leaks can be a nightmare for the average homeowner to track down and even more difficult to resolve. The most common sources of chimney leak problems are the chimney cap, the masonry, lack of a chimney liner, and flashing. Any one of these could be the source, and if you want the problem to be fixed the right way, it is important to seek the assistance of a professional. Call McNamara Construction for All Your Chimney Problems! If you suspect a leak in your chimney, let McNamara’s experienced specialists take a look at it for you. Whether the problem is a simple matter of replacing the chimney cap or a more challenging issue such as severely damaged masonry, we can fix your problem – no matter how old your home may be. Contact us today for a consultation!